Posted on 22 December 2018. Coal + Ice: Photos made in China at the exact same location 88 years apart show a profound loss of icepack. Part of a citywide series of climate-related events designed to showcase California’s pushback against Trump, this sprawling exhibition of A-list documentary photographers cast harsh light on the follies of Hydrocarbon Man, linking mining and the consumption of fossil fuels to ecological breakdown, poverty, mass migration and war. If deniers could be compelled to see this exhibition with their eyes pinned open a la Clockwork Orange, maybe we’d be looking at a different future than the one we now face. One of the first to seriously challenge the dominance of the decisive-moment approach to photography, Michals, over five decades, amassed a body of work that continues to resonate. This show, comprised of portraits, shows Michals operating with the alacrity of a street photographer, yet finding (or inventing) approaches that seemed tailor-made to each of his many subjects. Together, their names read like a who’s who of 20thcentury American culture. To January 6. Given the unsettling character of the art sometimes seen in this space, it made perfect sense to consolidate representative samples on the occasion of Frankenstein’s 200th birthday. “The subject matter,” wrote Justin Manley, “is heavy, and its combination of fantastical grotesques with artifacts of real-life atrocity requires fortitude and a morbid curiosity. 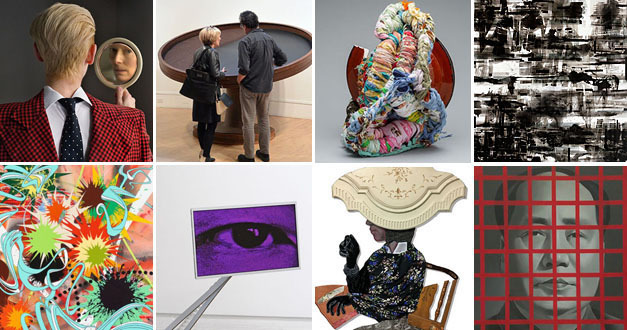 Determined visitors are rewarded with a show of first-rate artworks assembled with inspired curatorial vision.” Artists included Alan Rath(whose career retrospectiveopens February 16 at the ICA); Patricia Piccinini (whose current exhibition runs January 26); and Tim Hawkinson. Udo Nöger’s paintings should make you shiver. 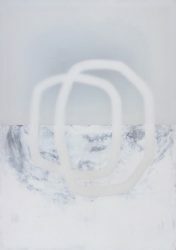 Their interlocking circles and totemic shapes — rendered in a near-monochrome color palette and set atop what appear to be ice flows, frigid waters and overcast skies – issue a distinct chill. They hang in mid-air like fever-dream visions, palpably real, yet remote — like what I imagine the Antarctic explorer Ernest Shackleton saw when he and his crew were trapped for months in polar ice, seeking an escape route to solid land while battling frostbite and snow blindness. These works are product of an elaborate and original painting process, designed to concretize light and to disguise the means by which it’s captured and shaped. 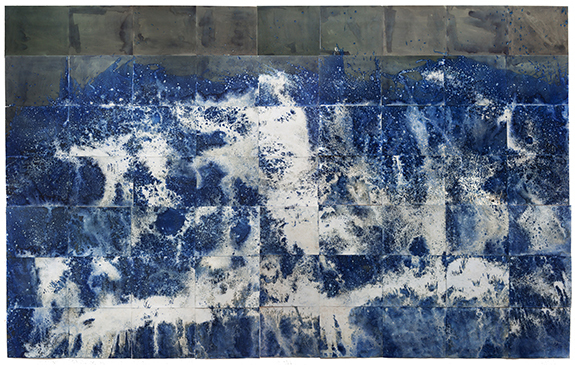 sand and doused with seawater that credibly evoked the ocean; and a photo-derived woodcut of a freeway overpass by Beth Howe and Clive McCarthy that came close to inducing vertigo through the strategic removal of visual information. His pictures posit a kind of Dada-informed Antebellum Postmodernism, one in which black men and women, swathed in mismatched, makeshift garments, appear as tangible apparitions, sending out veiled messages about their psychological makeup and their place in a hierarchy not of their own making. In this fictional universe, art-historical arrows point backward to Picasso’s borrowings from tribal art and forward to contemporary artists like Titus Kaphar and Michelene Thomas. No design team has had a greater impact on the American psyche than Charles and Ray Eames. You may not know them, but you surely know their work, in particular, those molded fiberglass chairs that became instant icons when they were introduced in the mid-1940s. 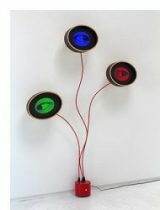 What also you may not know, but what the exhibition makes clear, is the stunning range of the couple’s inventions. 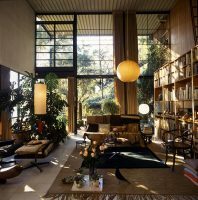 Their output included cutting-edge graphic design, experimental films, propaganda efforts on behalf of the U.S. State Department, and, most of all, model houses that stand as the epitome of Modernist design, if not the embodiment of mid-century America’s materialist aspirations. Robert Atkins' review puts it all in context. To February 17. Unbridled optimism. That is what we saw looking at the early years of the 20thcentury through the eyes of the Precisionists, a group of between-the-wars artists who took as their subject industry and its supposed splendors: skyscrapers, automobiles, suspension bridges, factories and the like. 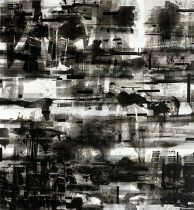 This tour de force of an exhibition, organized Emma Acker and reviewed by Mark Van Proyen, brought into sharp focus the distinct parallels between the naïve hopes of the Machine Age and the wide-eyed outlook that accompanied the growth of the Internet – before it became the handmaiden of Big Data. 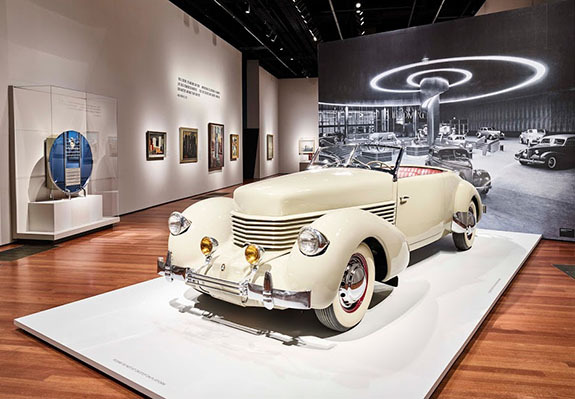 These intertwined exhibitions explored modernity with fat dollops of humor – slapstick Jewish humor. Goldberg’s legendary cartoons poke fun at the absurdities of American life, particularly those arising out of newfangled gadgets that were supposed improve life, but didn’t; while Contraption, a companion exhibition curated by Renny Pritikin, featured works by contemporary tinkerers (Bernie Lubell, Sheri Simmons), alongside those of painters, photographers, sculptors and conceptualists, all whom challenged notions of progress. China’s quick leap from agrarian poverty to industrial superpower upended the post-Cold War world order, bringing with it unprecedented levels of social, political, economic and environmental upheaval. 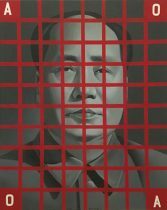 Operating inside this environment, artists exposed the emerging fissures, placing China and the art made therein at the center of the world’s contradictions. It’s difficult and sometimes painful show, but essential viewing for anyone seeking insight into the People’s Republic. To February 24. The old adage about ignorance of history condemning us to repeat it appears to be a driving force behind the work of LA artist Monica Lundy. 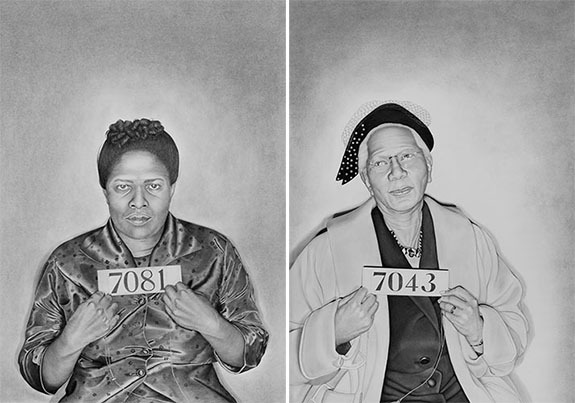 She’s devoted the past nine years to examining the fates of incarcerated women, turning archival photos into portraits on paper that attempt to reclaim lives marred or destroyed by injustice. Deviance: Women in the Asylum During the Fascist Regime, was based on a trove of photos culled from the archives of the Sant’Antonio Abate asylum, a psychiatric hospital to which women were involuntarily committed during 20 years of fascist rule (1920 to 1943). The paintings add a fresh chapter to the artist’s ongoing examination of the dark corners of women’s history. These action-filled Pop Surrealist-leaning paintings explode like fireworks. Loud, garish and hyperbolic in the extreme, they show endangered creatures perched or roaming unmolested amidst scenes of catastrophic disarray, lost in a cacophonous universe in which everything we take for granted has become dangerously unmoored. The mayhem appears to leave these creatures unperturbed, indicating that they are unaware of their fate. To look is to be both a witness and an accomplice. During an artist’s residency at Recology (the SF city dump), O’Arwisters looked at how crocheting could transform broken ceramics into something new. His experiments produced a suite of fantastically strange and deeply beautiful objects. Presented on pedestals of unfinished wood, the sculptures incorporate ceramic shards into fabric-based forms crocheted in a wild variety of colors and textures, proving yet again, how one person’s trash can, in the right hands, become another’s treasure. 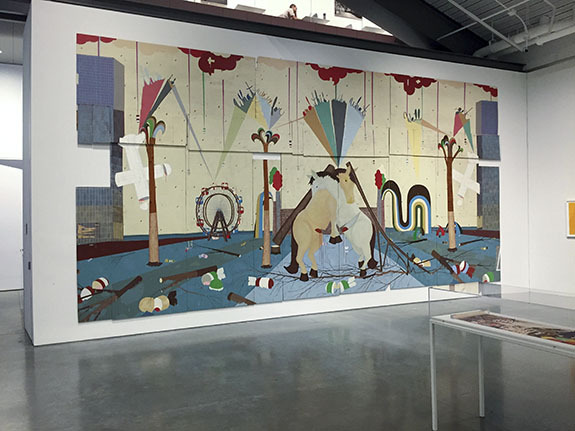 “It’s not possible to walk into Al Farrow’s Divine Ammunition without feeling both awe and soul-deep dismay,” wrote Julia Couzens. 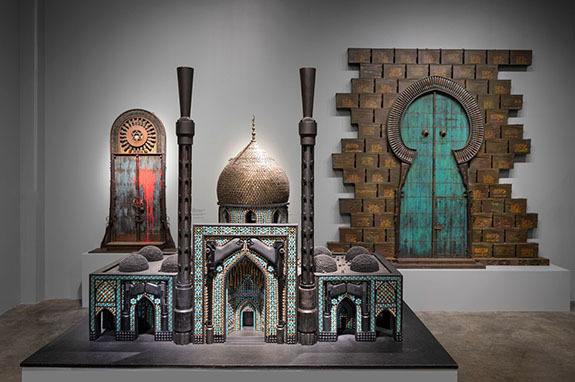 “The hatred that religions can breed is the blood-soaked ground upon which Farrow constructs models of mosques, synagogues, cathedrals, and reliquaries using munitions—a perversely incongruous counterpoint to the gospel of peace, love and tolerance we hear coming from pulpits.” The highlight and centerpiece of the exhibition is Farrow’s re-creation of the White House: “Like a massive architectonic skull, it issues a bone-chilling, silent scream: the sound of democracy disintegrating.” To Feb. 24. This is one body of work that absolutely cannot be understood in reproduction. It demands a face-to-face experience. 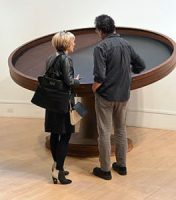 “Though one can say this is required for all art, wrote Maria Porges, “in this case, this assertion is more than a fatuous truism. 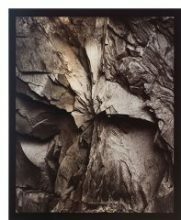 Maisel assembles photographic images into still lifes in shallow space, onto which additional collaged elements are added — creating diabolical shifts from three to two. The result is a trompe-l’oeil subtlety that toggles between flatness and space, between concrete objects and images of those objects. 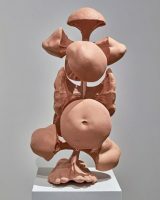 very concerned with the question of what it means to make art in a post-genome world in which each of us have become minor monsters of Frankensteinian provenance.” Here as before, Hawkinson uses povera materials to bring “a science fiction sensibility to the interstitial space between sculpture and installation,” the result being an even more pronounced blurring of the line separating realism from Surrealism. “On the morning of the tenth day at sea, I awoke to the sound of that old man asking for help to push the young man’s dead body into the water.” Those words, spoken by a former Vietnamese boat person, are scrawled across the back of a snapshot — one of hundreds in Dinh Q. Lê’s installation Crossing the Further Shore, the emotional magnet and centerpiece of his exhibition True Journey is Return. Battered and yellowed and loosely stitched together into boxy enclosures, “they show, writes Patricia Albers, “what art can do and politics can’t.” To April 17.